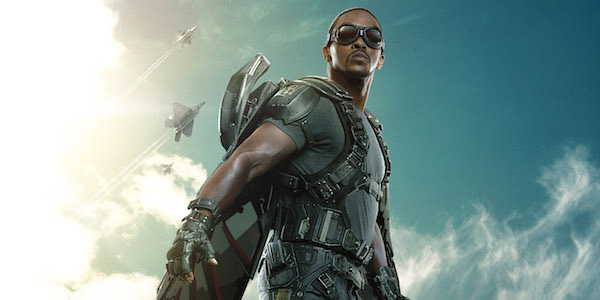 Interview: We Chat with CAPTAIN AMERICA: CIVIL WAR Star Anthony Mackie! Hey young folks! Earlier this week, I got to take part in a roundtable interview with The Falcon himself, Anthony Mackie. He talks about what it’s like interacting with fans, the message of the movie, the double standard for boys and girls plus more! Having worked both on screen and the stage, Mackie divulged into how the two are different. Seeing as though every character from the Marvel universe is getting their own solo movie, Mackie chimed in when asked what he would want in a Falcon solo movie. Essentially, the movie is about two characters fighting for what they believe in. In this day in age, everyone has an opinion, but few are willing to listen. Mackie remembers learning “just shut up and listen” in acting school. “The ultimate power is not being a dictator. The ultimate power is being a great listener,” said Mackie. Civil War has its fair share of superheroes facing off, but there’s one in particular that Mackie wouldn’t have mind seeing in the movie. Mackie feels lucky to do what he does. And every movie he’s done, there’s a reason for it. Besides doing Civil War because, as Mackie said, Marvel told him to and it’s in his contract, it is a very timely movie. The film falls on an election year and aligns with the idea of citizens fighting for their civil liberties. “Do you want to be governed, or do you want to choose for yourself?,” asked Mackie. Captain America: Civil War it out NOW! Previous Article'The Trials of Apollo' Giveaway: Win Rick Riordan's new book! Next ArticleRed Hot Chili Peppers release new single "Dark Necessities"